Three years ago, Boston College acquired what the Sunday Times of London called "one of the world's most important collections" of materials by, about, and belonging to the Irish Nobel Prize–winning dramatist George Bernard Shaw. Curator David Horn sorted through the 3,400 items, and the John J. Burns Library has put some of the contents on public display. Manuscripts, photographs, cartoons, and letters reveal a cranky vegetarian literary dynamo who offered civilization a new alphabet (and was rejected) and mass-produced an arsenal of postcards to counter his admiring public. The exhibit, from the Samuel N. Freedman collection, runs until March 31, 2005. 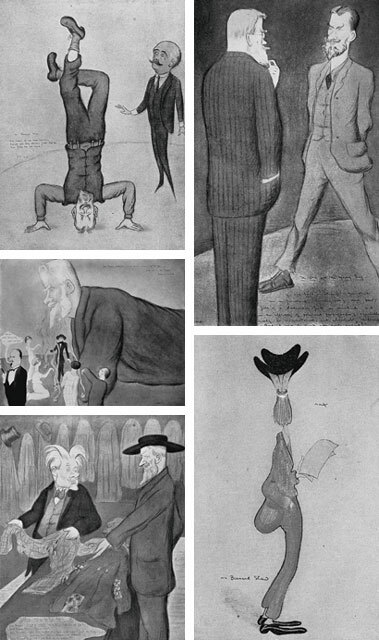 Cartoons by Max Beerbohm. Postcards by George Bernard Shaw. Mr. Bernard Shaw regrets that he is unable to undertake any extra literary work at present. His time is filled up for months to come. Mr. Bernard Shaw, though he is always glad to receive interesting letters or books, seldom has time to acknowledge them; for his correspondence has increased to such an extent that he must either give up writing private letters or give up writing anything else. Under the circumstances he hopes that writers of unanswered letters and unthanked friendly donors of books and other presents will forgive him. Mr. Bernard [sic] implores his friends and readers not to celebrate his birthdays nor even to mention them to him. It is easy to write one letter or send one birthday cake; but the arrival of hundreds of them together is a calamity that is not the less dreaded because it occurs only once a year. Acknowledgment of such unwelcome letters and gifts is not possible. Mr Bernard Shaw is often asked to contribute prefaces to unpublished works. Sometimes the applicants add that a few words will be sufficient. This obliges him to call attention to the fact that his prefaces owe their value in the literary market to the established expectation of book purchasers that they will prove substantial and important works in themselves. The disappointment of this expectation in a single instance would destroy that value. A request for a preface by him is therefore a request for a gift of some months of hard professional work. When this is appreciated it will be seen that even with the best disposition towards his correspondents it is not possible for Mr. Shaw to oblige them in this particular manner. Mr. Bernard Shaw's readers and the spectators at performances of his plays number many thousands. The little time remaining to him at his age is fully occupied with his literary work and the business it involves; and war taxation has set narrow limits to his financial resources. He has therefore to print the following intimations. He cannot deal with individual grievances and requests for money, nor for autographs and photographs. He cannot finance schools and churches. His donations go to undenominational public bodies, and his charities to the Royal Society of Literature. He cannot engage in private correspondence, nor read long letters. He cannot advise literary beginners nor read their unpublished works. They had better study The Writers' Year Book (or other books of reference), and join the Society of Authors as associates. He cannot discuss his published views in private letters. He cannot receive visitors at his private residence except from [sic] his intimate friends. He will not send Messages. He begs to be excused accordingly.